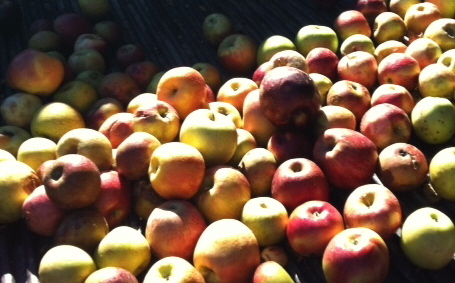 Apples, a Cider Press, and a Party – Johntheplantman's stories, musings, and gardening. The day was a beautiful Sunday, October 20, 2013. Dekie had given me tickets to a Kristofferson concert in Atlanta and since we were going to the big city anyway we decided to stop by and visit our friends, John and Jane Kenna who were having their annual cider pressing party. John has an amusing tale of purchasing a hammer mill in Highlands, N.C. a number of years ago. 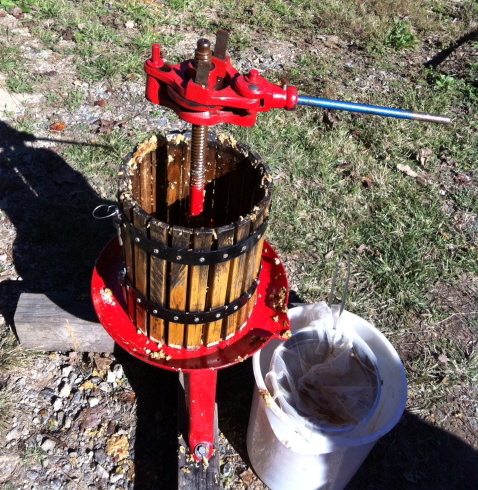 As he was loading the machine he found that he had also unknowingly bought a cider press. That started his obsession with cider pressing. I have some interesting friends. John takes his truck to Mercier’s in Blue RidgeGeorgia where they sell him a load of cider apples (seconds, not the premiums). The truck will hold 18 to 20 bushels and there will be several varieties including Granny Smith, Mcintosh, Golden Delicious, Arkansas Black, and Winesaps. Apples for the cider pressing party from Mercier’s in Blue Ridge, Ga.
Here’s a picture of John Kenna with the hammer mill that started it all. 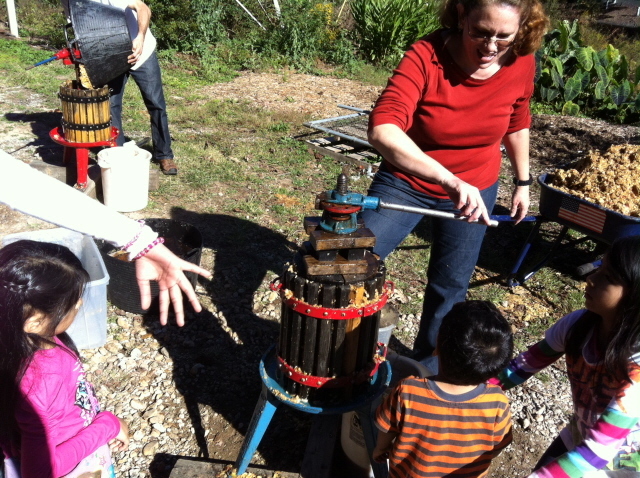 Lots of people show up for the party and there is plenty of help to throw the apples into the machine that chops them up and spits the “pumice” into a large bucket. 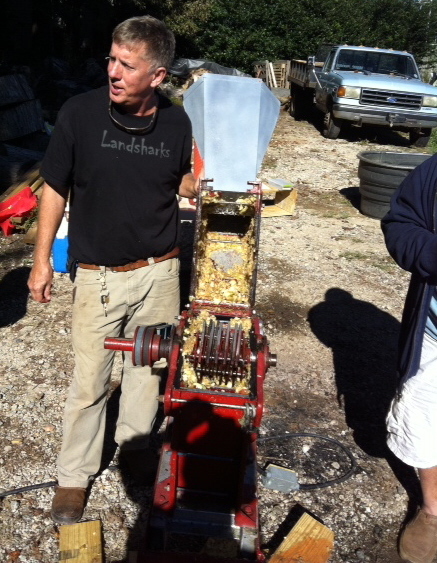 John Kenna with his hammer mill that chops up the apples. 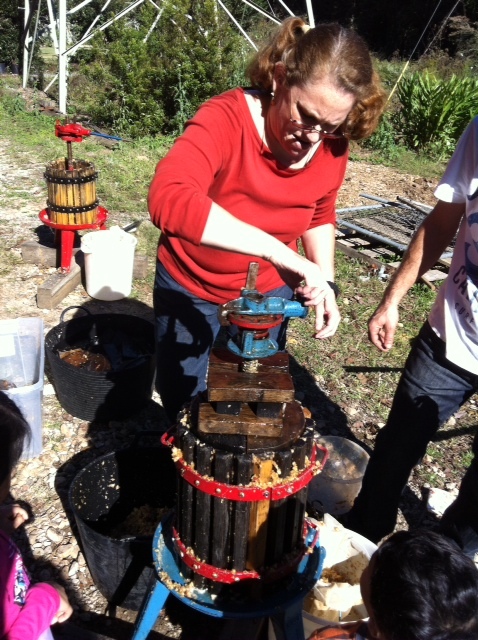 The ground up, chopped up apples are carefully emptied into the press. When the press is full, a series of wooden blocks are placed on top of the pumice in a manner that will force the mess down under force. 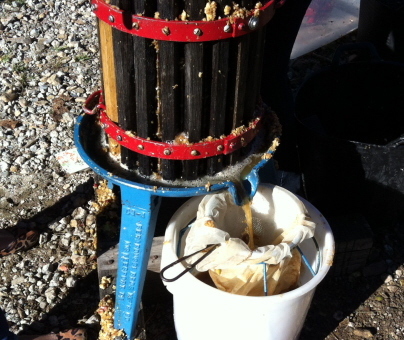 The cider flows out through a spout and into a strainer, ending up in a five gallon bucket. 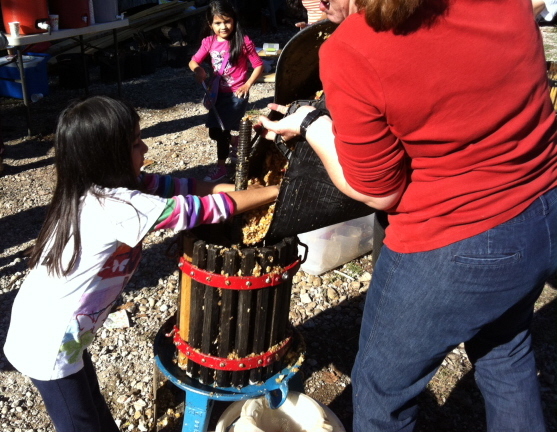 Guests at the cider pressing are encouraged to bring a jug or two so they can take some cider home. 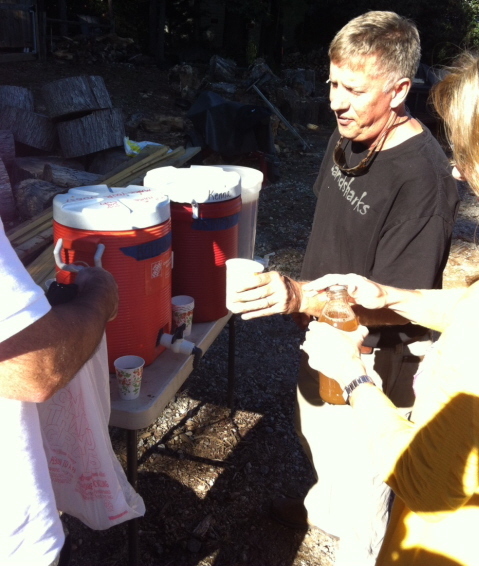 John pours cups of cider and hands them out to all takers. He told me that the cider really tastes good with a shot of good bourbon. I tried a sip but couldn’t taste it on account of what chemotherapy has done to my taste buds. I did, however, remember past parties when I enjoyed it. John Kenna hands out cups of cider. Jane Kenna told me that they started the parties about ten years ago. 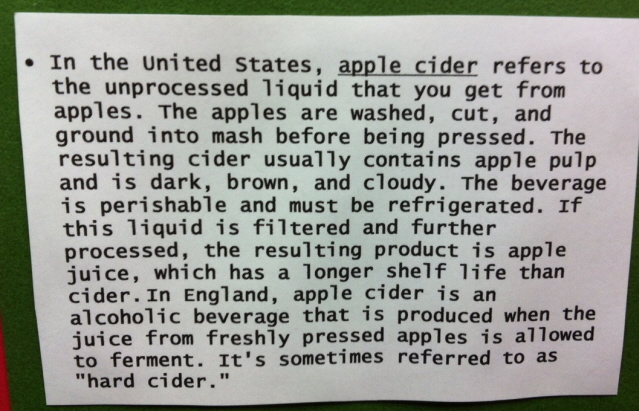 She said, “We enjoy getting family and friends together to work on making cider and learning about apples.” While looking around I found a note about cider that I found interesting. A little info I found in my wanderings. Thanks for visiting John the Plant Man. 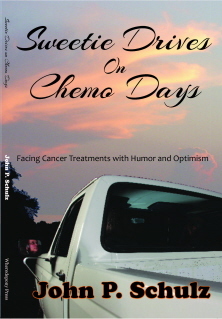 Remember, Requiem for a Redneck by John P. Schulz is now available in the Kindle Store as an ebook.